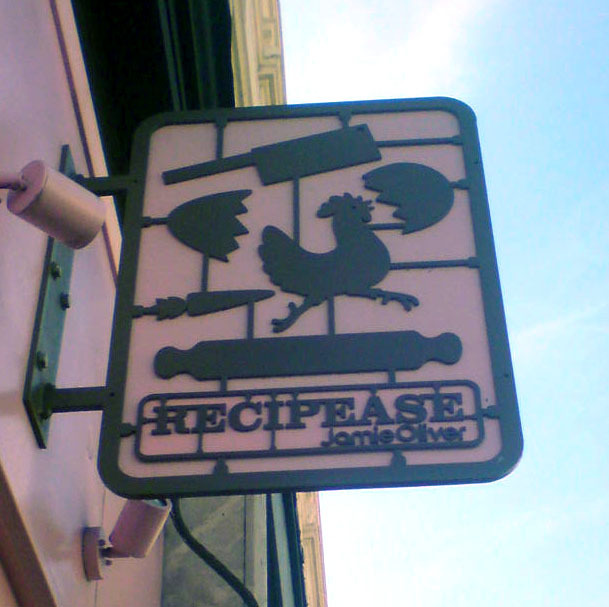 Yesterday I went to visit my lovely friend Katie in Brighton and stumbled upon Jamie Oliver’s Recipease, which is a food and kitchen shop that runs cooking lessons and sells kitchen equipment, ready prepared food and other bits and bobs. I was totally shocked. 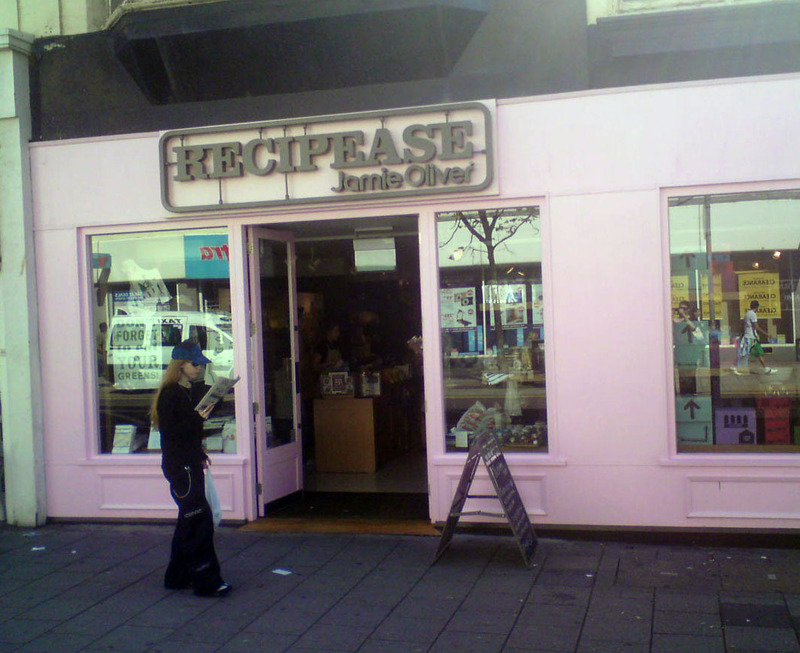 I had no idea there was one in Brighton, but I’d been lusting over the one in Camden a while back, trying to see if I could fit in a recipe sesh during one of my trips to London. Ach, as if. So when I went into Recipease, I was, as usual, like a kid in a candy shop. I must have walked around that shop about three times, touching everything. “I want to buuuuy something…” I moaned. I’m always like this. If I go somewhere cool, and there is a shop, I must buy something. I feel like an explorer gathering exotic artifacts to bring back home – to prove I’ve been somewhere. Like, if I don’t bring something back, I might forget I ever went. It’s sort of a way of taking a bit of that coolness and preserving it forever in my house – which is of course what those hard hearted marketing bastards want me to think. So I wandered around and around, a helpless consumer, past the class learning how to make pasta (I’d love to be in a pasta cooking class! ), past all the ready cooked meals, past the mixing bowls and glassware, past all the bread and the jam, and back again. Eventually, I bought a set of measuring spoons, cos I always run out, even though I have three sets already. That’ll show those doubters back home I went to Jamie’s place! On the way back out I picked up a leaflet about the store, and we retreated to Starbucks to spend M’s vouchers – which he turned out not to have, but that’s another story. I took a look at the leaflet, and on the inside it had a map of all the foodie destinations Brighton had to offer – including a place called ‘Jamie’s Italian’. 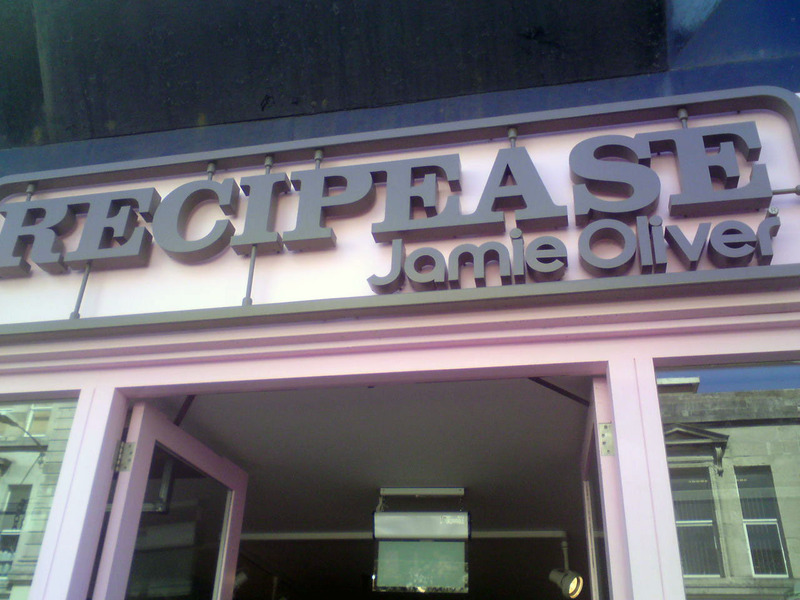 I knew Jamie Oliver was making a chain of Italian restaurants, but I didn’t realise there was one in Brighton. Why had no one told me? I like Jamie Oliver. I like Italian food. I like Brighton. Why did the world conspire against me to hide this amazing combination of pleasing concepts? I’m totally shocked I didn’t get invited to the launch party. So of course, we had to go check this place out, and very nice it was too. We got in about ten past six and waited for about forty minutes – nowhere near as long as the 1-2 hour waiting time we’d been warned about earlier in the day by the host. We were seated right near the entrance, so it was only until someone ventured forth to find the loo that we realised how big this place really was, with loads of tables behind the bar, plus a whole floor upstairs. 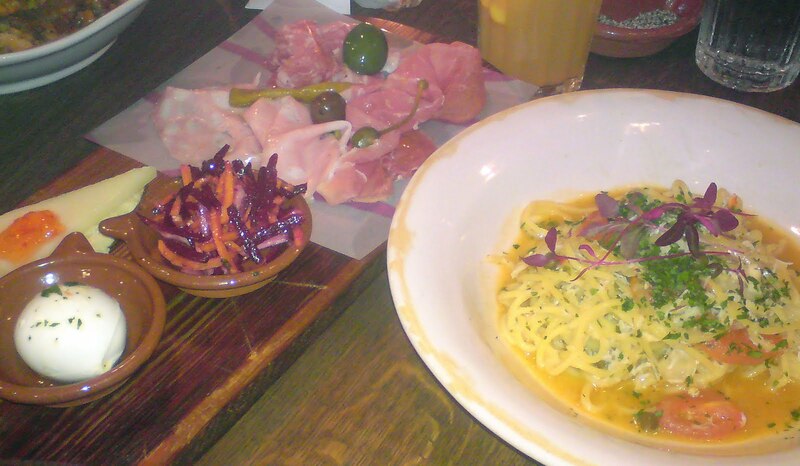 There was a really fun, foodie vibe about the whole place, generated by the chefs slicing up ham and waiters cutting hunks of bread, plus the chalkboards and Italian paraphernalia about the place like olive oil and legs of dead pigs. M had the sausage pappardelle, K had lamb chop lollipops, and I think J had spaghetti bolognaise. We all enjoyed ours – K the most. I think it definitely lived up to the brief of showing Italian food to be a celebration of simple ingredients and flavours. The food was lovely, but not overly ‘special’ or fancy. I definitely appreciated being able to have a couple of smaller courses without spending a fortune. Of course, this will be the last time I ever need anyone to make pasta for me, as I’m definitely going to enroll in a course and become a pasta-making guru myself. I don’t know if I’ll do a TV show about it, I haven’t decided yet.